Most floors will require a profile that divides two rooms with different floor types and heights. 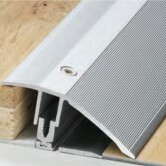 By using an aluminium profile this problem is solved quickly due to an adjustable feature found on the product. 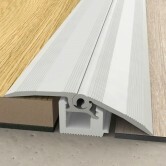 So regardless of floor type either side of the door threshold these profiles can still be used. 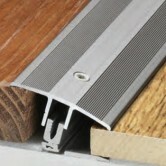 Some of our aluminium profiles are available in different colours, including: silver, gold and bronze. If you are still deciding upon your floor, we have a wide range of hardwood floors in both solid wood and engineered wood format that can offer either a traditional appearance or a more contemporary and modern look. For any technical advice about which flooring accessories you may need in order to fit your floor, please either visit our showroom or contact the sales office, and we will be happy to answer any questions you have.